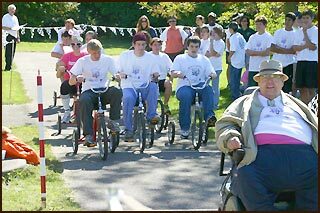 Event Description: Brian's Trike Race is an Annual fun race organized by the Indiana Lions for the Indiana School for the Blind and Visually Impaired (ISBVI) State Project, a 501c3 organized by the Lions Clubs of Indiana, specifically dedicated to providing enhanced opportunities to the students of the ISBVI and those who partake of their services. 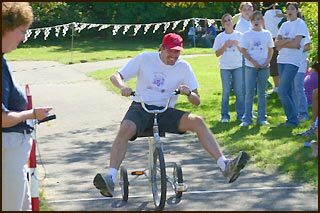 The race is a community event wherein teams of Students, Lions, and non-Lion adults race full-size tricycles in a fun race around a track at the school. Venue Description: The Indiana School for the Blind and Visually Impaired is a state institution serving approximately 200 on-campus youth between the ages of preschool and high school. Students come from around the state and the school provides extension services throughout the state. The race is held on the David Letterman (yes, that David Letterman) track at the school. The track is surrounded by trees, a playground, school buildings, and a parking lot in which the event coordination and booths are stationed. Booths are populated by other Lions charitable groups and a very limited number of Platinum sponsors. Attendance: Total attendance for the event is approximately 300 people of a variety of age ranges. Those in attendance are all Lions or those supporting the cause of the school. These community-minded individuals are participants in the race, supporters of the teams, or event volunteers. Sponsorship Opportunities: Last year's sponsors listing may be found here. CONTACT: Project Chair Pat Henninger at 317-908-8884 or iwtlions@gmail.com.